When Emma Guffin and Sam Price envisioned a romantic yet whimsical fairy-tale wedding, they had no idea how wonderful it would be. 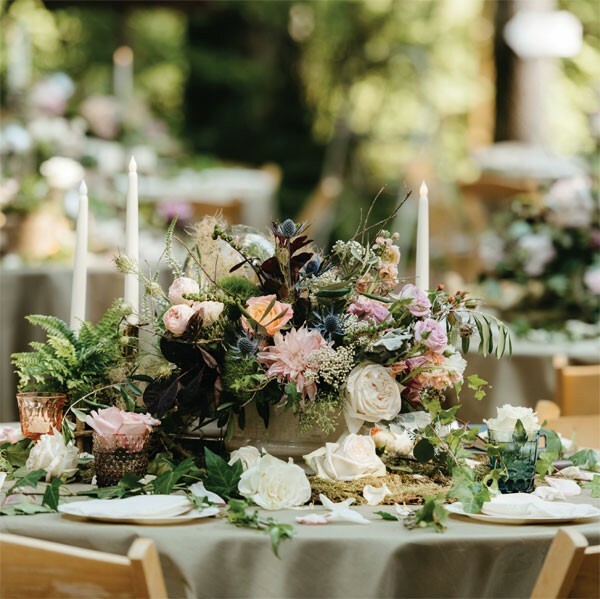 “We looked at a lot of spots and finally we found the Cooper Creek Inn near Mount Rainier, and it was the perfect wood-inspired backdrop,” the bride said. The couple loves to spend time outdoors and camping together. In fact, Sam proposed to Emma on a camping trip. “Once we found the location, we asked my mom to help with designing the decor and look and feel for the wedding and ceremony,” said Emma. The planning took place over a year. It was a romantic and whimsical time for all who attended. The bride’s mother, Debbie Guffin, said she had a wonderful time creating the ambiance for the event. To create this spectacular fairy-tale wedding, the family worked with Blitz & Co. Florist in Tacoma. “This was one of the really amazing events that we had the opportunity to partner on and fulfill the wedding design ideas through floral and greenery applications,” said Steve Barbazette at Blitz. During the wedding ceremony a string quartet played to enhance the romantic mood. As a creative touch, there was also a cigar bar down another trail and a love potion station where the couple did their wedding toast. The wedding told a romantic love story. “It was so much more than we could have imagined,” said the new Mrs. Price. It seems love was truly in the air during the fairy-tale wedding in the forest.